Wednesday Wrap: PS4 limited edition, Primare's aptX upgrade, Xbox One wearable | What Hi-Fi? From the debut of a limited edition finish for the Sony PlayStation 4 to confirmation that Primare has introduced aptX Bluetooth to a number of its products – here is the news in brief from What Hi-Fi? 's Wednesday Wrap. We have to begin somewhere and, this week [3rd December], it's with a special anniversary as the Sony PlayStation turns 20 years old. And, to celebrate, the Japanese company is unveiling a limited edition PS4. 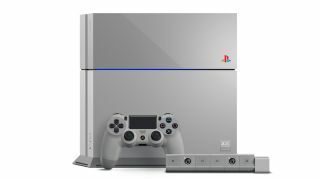 It'll come in the same Original Grey finish that helped make the original PlayStation console so iconic back in the mid-1990s. There will only be 12,300 units made available worldwide and it will set you back €499. Primare has announced an aptX Bluetooth upgrade for its PRE60 preamplifier, NP30 network player and MM30 equipped network streaming versions of the I32 integrated amp and PRE32 preamplifier. This upgrade comes in the form of a small internal circuit board and external antenna, with the threaded antenna input replacing the FM/DAB terminal on the MM30 fascia. On the NP30 and PRE60, it makes use of a vacant port. Flexson has announced the debut of a new black edition of VinylPlay, the Sonos-ready record player that made its first appearance at IFA 2014 in September and is designed for the "music streaming generation". At the same time, the company has revealed that VinylPlay has proved so popular that it's sold 10 times faster than it first predicted. The black edition is now available direct, via Amazon and other retailers for £330. Xbox One wearable on the horizon? Microsoft is developing a wearable device that will sync with the Xbox One's health and fitness apps, with the product due to launch in 2015 – according to a new report. The console already features some fitness tracking elements using Kinect. Joe Officer of Exertis,an Xbox One component supplier, told PCR that a number of Microsoft wearable devices are coming next year. He said: "These will be linked to the Xbox One which has loads of health and fitness apps already in it." Vodafone is poised to purchase the Blinkbox streaming service from Tesco, with talks currently at an advanced stage – according to the Telegraph. It is understood that the mobile operator is now the last bidder standing. It's not thought a huge sum will be involved, with Tesco looking to sell the loss-making service – Blinkbox reportedly lost £18.5m in its most recent annual accounts. And while it isn't certain a deal will be completed, a deal is thought to be close. Sonos isn't taking the challenges to its multi-room market dominance lightly, with the company raising $130m of additional funding according to an SEC filing. That funding adds to $325m it had previously secured, taking the total to $455m. It is believed the fresh investment could help Sonos to expand its marketing campaigns, while TechCrunch has also suggested that the company could spend more on R&D and develop new additions to the family – but there's yet to be any official comment either way.